Remember the days of sitting your television, stereo, speakers and movies on top of a wobbly coffee table or even old boxes and crates? Or the frustration of having your television, stereo, speakers, and wires dangling around your media room? Or having your movies in four different locations around the house? If you appreciate the convenience of the digital age, but would rather not have TV’s and media clutter your space, a custom entertainment center is the perfect answer. Between the cable/satellite box, game systems, digital boxes, and miles of cable it’s a visual and storage nightmare. Add in DVD’s, games and other entertainment media, and suddenly, the clutter is chaos! With dedicated space for all of your components, books, CD’s, DVD’s, and more. Finally, more gadgets doesn’t mean more mess! 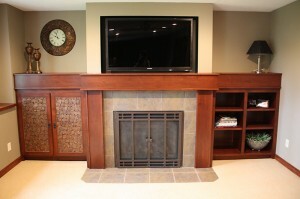 Now imagine a custom built entertainment center without a cord in sight! Your room can be neat and organized with built in areas to manage your “stuff”. Hiding behind those cabinet doors is the power of every gadget at your fingertips. All the electronic and accessories your heart desires can be neatly organized into one classy piece of furniture, custom fit to your equipment. With dedicated space for all of your components (and more), finally, more gadgets does not mean more mess! Whether you call them entertainment centers, home theater cabinets, or media cabinets, to get the most out of your latest hi-tech audio components, and all of the accessories that go with them, you want the right piece of furniture to hold them all neatly. A custom entertainment center will fulfill all of these needs! A custom built entertainment center can be designed to corral the maze of wires and blinking LED’s with multiple wire access ports that are discreetly integrated into the back of the cabinetry, as well as shelving to enable consumer electronics and equipment to be powered and connected together. Because of the constant stream of new technologies available in this consumer electronics age, a well built cabinet will survive through many technological generations of equipment and you will want to be able to use the new equipment in your existing cabinet. Who needs the hassle of connecting wires, hunting for the right DVD or CD or stacking your valuable equipment on top of each other? With a custom entertainment cabinet you can store all of your home theater equipment together and never have to see wires dangling around your media room again! Your media room may quickly become the most popular room in the house for years to come! Contact Danner’s Cabinet Shop today at 763-753-4002! We will meet with you to measure your space, inventory your equipment, and discuss your needs to be sure no detail is overlooked. After we have a complete understanding of how you want your media room to look and function, your custom cabinets will be fit for your exact configuration to fit all of your electronic equipment requirements.